Music themed tie clips are great music gifts for men! Music themed tie clips are the foundation of our collection of music jewellery and accessories for men. Whether you are wearing a three-piece suit for special occasion or a daily shirt and tie, a necktie with a musical tie clip from TAF Music Gifts will give any gentleman a trendy modern look. Our tie clips are decorated with glittering effect to add that extra sparkle. We are constantly adding new design to the collection. 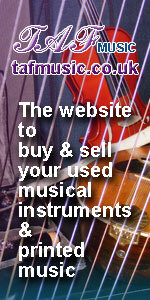 There are currently piano / keyboard and treble clef bass guitar themed for you to choose from. Click on an image below to view a tie clip in more detail. You may also be interested in our range of cufflinks in matching or similar design. All tie clips and other music gifts for men are individually hand designed and hand-assembled in Herefordshire, UK. They make eye-catching & unique music themed gifts for musicians, friends and family.